So we got home from our two weeks out of town and I immediately had to run to the grocery store because I was asked to bring dessert to a church meeting that evening. I didn't have enough time to bake - Darn! I went to Fred Meyer and spent $12.04 on a few things, but forgot to take a picture. Coffee creamer was $2.50, Cantaloupe was $0.38/lb, Lettuce was $1.29, Cucumber $0.79, Bananas $0.64/lb and the requested dessert: Oreos $2.50 and Chips Ahoy $2.75. The very next day I took all 4 littles on errands and we stopped by QFC. I spent $17.85. 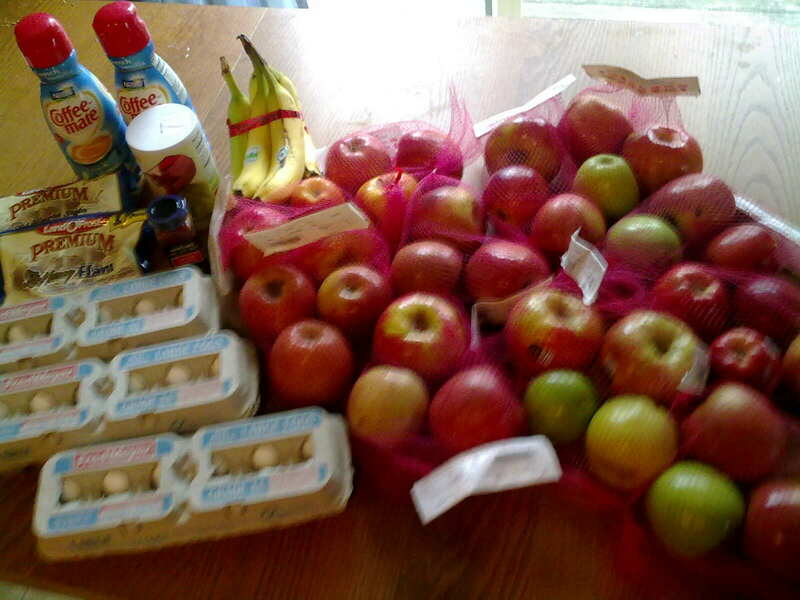 I went to Fred Meyer later in the week and scored on produce markdowns. I spent $25.33. Apples - $1.00 per bag - each bag had at least 2 pounds and most of them Honeycrisp! This is going to make some amazing applesauce! I also picked up smoked paprika at Trader Joe's for just $1.99. Costco was necessary for flour and lettuce. I spent $41.36. Milk delivery was $11.16 and Eggs were $4.00. I am super excited for Fred Meyer's Founder's Day Sale this coming week! Hoping for awesome deals!